Ships tomorrow if you order in the next 18 hours 19 minutes. "Super-Foods" are the foods we should eat daily for optimum health and wellness. However, most of us do not get them in our standard diet. 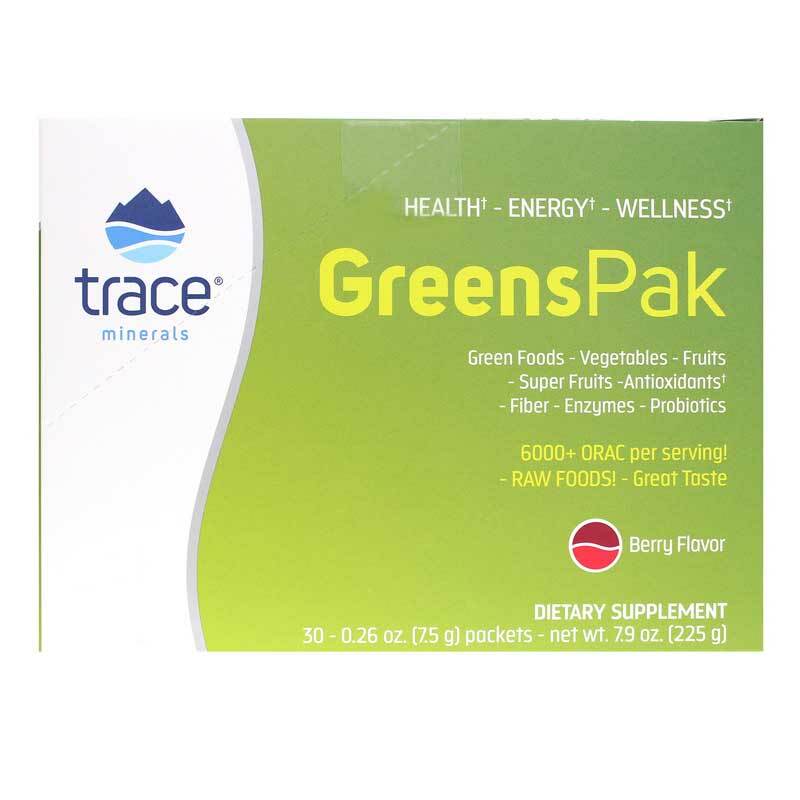 Greens Pak by Trace Minerals is designed to support nutrition, digestion, circulation and immune health. This formula is great-tasting, easy-to-mix phyto-nutrient powder. It is loaded with energy-packed whole food, super fruits, antioxidants, enzymes, probiotics and fiber to help energize your body. These packets features a unique blend of 72 ionic minerals and elements from ConcenTrace, which is an ionic mineral complex that supercharges the other nutrients for quick absorption and assimilation. It provides the necessary nutrients your body needs to help fight against environmental toxins and balance your diet with key ingredients. Start including all-natural super foods into your regular diet. 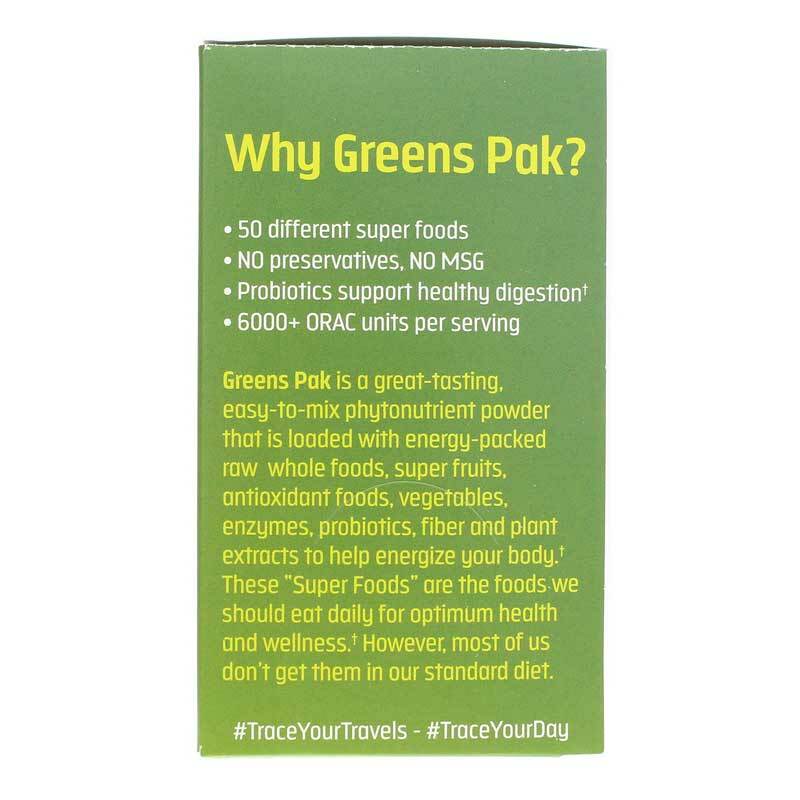 Try Greens Pak To Go Berry Packets. Fiber Blend (1538mg) of: SDG Flax Lignans Concentrate (cert. organic), Oat Betaglucan (cert. organic) Apple Fiber Pectin, Sprouted Barley Malt (cert. organic). Greens Blend (1508mg) of: Barley Grass Juice Powder (cert. organic), Chorella (Japanese cracked cell wall), Spirulina (cert. organic), ConcenTrace Alfalfa Ionic Trace Mineral Complex (proprietary blend). Vegetable Blend (cert. organic) (1500mg) of:Carrot Juice Powder, Broccoli Juice Powder, Cauliflower Juice Powder, Spinach Juice Powder, Parsley Juice Powder. Antioxidant Blend (1144mg) of: Concord Grape Powder, Acerola Cherry Powder, Milk Thistle Seed Extract (80% Silymarin), Red Beet Root (cert. organic), Aloe Vera Leaf Powder (cert. organic), Pomegranate, Turmeric Rhizome Ext. (85% Curcuminoids), Atlantic Kelp Powder (cert. organic), Green Tea Extract Decaf (60% Polyphenols), Quercetin (98% Dihydrate), Polygonum Cuspidatum (Trans Reservatrol 50%), Red Wine Extract, Grape Seed Extract, Blueberry Leaf Extract, Vegetable & Fruit Extract (Antioxidant Blend). Enzyme Blend (150mg) of:Bromelain Extract (600 GDU/g), Papain, Protease, Amylase, Lipase, Cellulase, Lactase. Other Ingredients: Stevia, Citric Acid, Cinnamon Powder, Natural Flavor. Contains NO: artificial colors, flavors, preservatives, dairy or MSG. Allergen Info: Contains gluten from oats and barley. Adults: Open packet and place the entire contents of the packet into 6 to 8 oz. of water and stir. May also be put in juice, a smoothie, or other beverage. Some caking may occur. This does not affect the safety or integrity of the product. I use this product in my morning juice. I feel good knowing I am having additional nutrients from Greens Pak. Have taken Greens Pak to Go for about 5 years and I notice when I do not take them.